In 1908, an explosion as powerful as an atom bomb knocked down millions of trees in the forests around the Podkamennaya Tunguska River, in Russia. Although it was believed to have been caused by the air burst of a large meteor or comet, no trace of cosmic debris has ever been found. Until now. Ever wondered what Earth's geophysical features would sound like if transposed onto vinyl? The Flat Earth Society has the answer. CERN is currently engaged in a bit of electronic archaeology: attempting to recreate the first web page every made. The earliest version they have found so far is from November 1992; older versions were rewritten without first caching backups. It's somehow liberating to think that even in the great sleepless communal panopticon of the internet, historically important documents can be forgotten and lost, that as in the happening world its past can slowly be unremembered, and become the actual past. 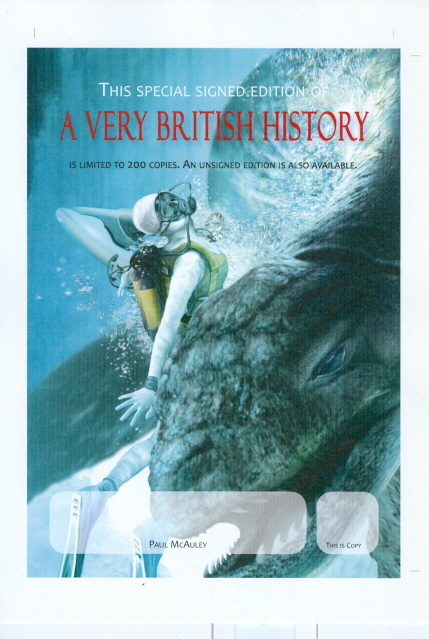 Using one of the lesser-known superpowers the jobbing author must develop - being able to reproduce my author's autograph as quickly and accurately as possible - I've just personalised the signing sheets for the limited edition of my new short story collection, A Very British History. Since it's a proper limited edition, it wasn't a tremendously onerous task: there were only a tad over 200 sheets to be inked. Now all I need to do is pack them off to PS Publishing. The finished books should be available in a few weeks. The illustration on the signature sheet is a close-up of part of Jim Burns's wonderful wrap-around cover. The limited edition is slip-cased, with a separate volume containing two additional stories, ﻿‘Searching for Van Gogh at the End of the World’ and ‘Karl and the Ogre’, and an autobiographical essay, 'My Secret Super Power.’ And if you don't want to splash out on a limited edition, some copies of the jacketed hardcover, containing 21 science fiction stories, from my beginnings in Interzone magazine back in the 1980s to 2011's award-winning 'The Choice', are still available.